Naxos, the largest of the Cycladic Islands in the Aegean Sea, is thought to also be the most beautiful of the Cyclades and the nicest to visit. According to Greek mythology, Naxos was the childhood home of Zeus, the King of the Gods. One of Naxos’s defining features is that it is the most fertile island of the Cyclades. Mount Zeus, the highest peak in the Cyclades, traps the clouds, which permits greater rainfall here than the other islands where water is scarce. The result is that Naxos is the most self-sufficient island in the Cyclades and agriculture is important to its economy. The island is home to various vegetable and fruit crops, wheat fields, potato fields, livestock breeding, and a successful cheese industry. Naxos Town (Hora) is Naxos’ port and capital. It is divided into two historic neighborhoods of the Venetian era. 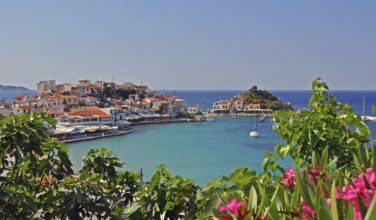 Bourgos is where the Greeks lived and Kastro is where the Roman Catholics lived. In Naxos, “Kastro” can refer to two things. 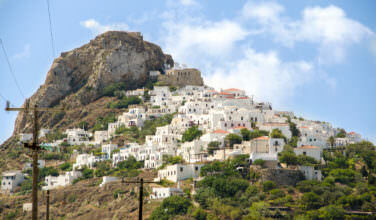 First, it is the name for Naxos’ greatest treasure, the 13th century Venetian castle. “Kastro” also refers to the neighborhood around the castle where the Venetian nobility lived from the 13th to 16th centuries. 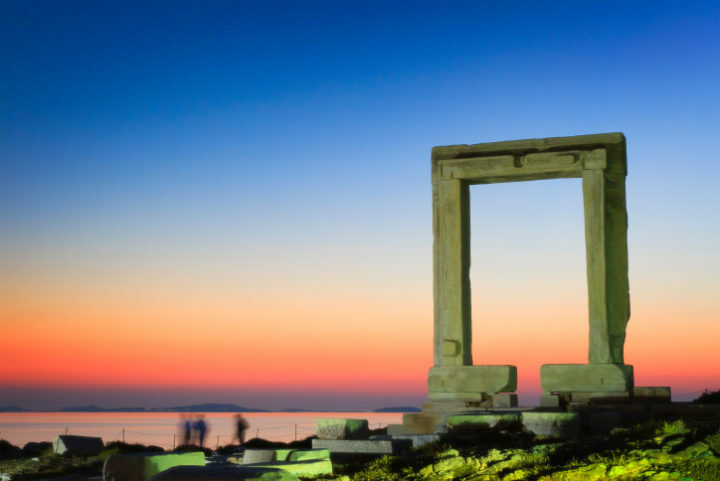 The Portara is Naxos’s most famous landmark and is known as the “doorway that leads to nowhere”. This massive doorway is all that remains of what is thought to have been a Temple of Apollo. Scholars think it was dedicated to Apollo because of a brief reference in the Delian Hymns and because it directly faced Delos, Apollo’s birthplace. Most of the temple was taken away and used to build other monuments and buildings but the posts of the Portara were too heavy to move. Each of the surviving blocks weighs about 20 tons. The Domus Venetian Museum is housed in a typical aristocratic Venetian house, the 800-year-old Della Roca family home. It is filled with many objects ranging from the Cycladic period to Victorian times. 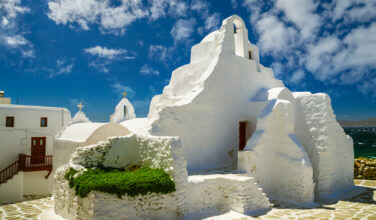 It offers a chance to get to see inside of one of the surviving Venetian homes on Naxos and learn about the reception rooms, chapel, and vaults. A small shop inside the museum sells local produce and handicrafts. Each summer during the Domus Naxos Festival, a wide variety of concerts and Greek dance performances take place in the garden here. This archaeological museum is best known for its Cycladic and Mycenaean objects from the settlements along Naxos’s east coast and outside Naxos Town. Many were found in graveyards. The highlight is the collection of Cycladic statuettes, from early “violin” shapes to more detailed female forms with flat heads, folded arms, and slightly bent legs. A common theory is that they were fertility and grave goddesses. The best beaches are along the southwest coast of Naxos where you can find long stretches of sandy beaches.